The City of Elgin: A public sector ROI story. 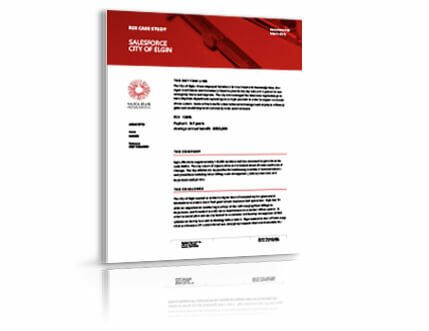 The city of Elgin, IL, deployed Service Cloud to streamline the functioning of 19 departments within the city government. Elgin wanted to create a 311 system for non-emergency requests that would associate requests with the appropriate contacts. In so doing they unlocked a return on investment of 120%. Supported the functioning of 19 departments. The best way to deliver industry-leading customer service is to start with the world's #1 customer service solution. Building on the Salesforce1 Platform affords the type of flexibility that the public sector needs, while also providing an enterprise-grade solution that promotes interdepartmental sharing and greater efficiency and agility. Read the Nucleus Research report to see how.